The Globally Harmonized System (GHS) is a set of standards that has been adopted by companies, governments, universities and other institutions around the world. The system is focused on creating one set of standards for hazard communication which will also ensure that those who use this system agree on things like the criteria for the classification of different chemical hazards. While the system was created largely to help get everyone on the same page when it comes to hazard communications so that it was easier and less confusing, it does require that those who adopt the system take the time to really understand it. 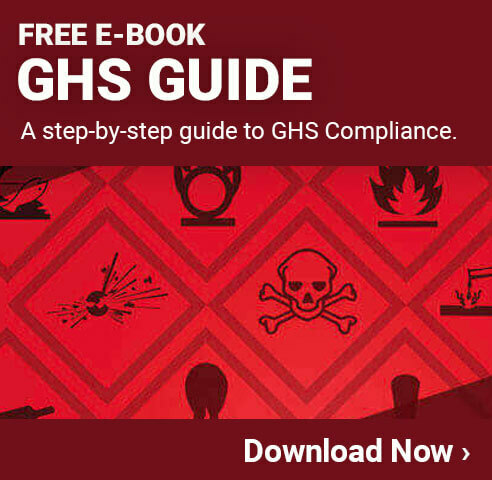 This guide will help you to learn what GHS is, how it can help your facility, how it should be implemented and much more. This guide is not meant to replace any official training courses or compliance manuals. Instead it will help give you more of a high-level overview of what GHS is, GHS compliance requirements, how GHS can help your facility and more. GHS stands for "Globally Harmonized System" (of classification and labeling of chemicals). The reason GHS was created and why it is used in so many places today is to help improve workplace safety. By implementing a global set of standards it is much easier to help ensure people from all over the world understand what a particular label means, for example. This is important since chemicals are often made in one country and then shipped to another for use. Having one set of standards helps to avoid miscommunications, which can result in serious accidents. In addition, when you have one global set of standards you don't need to worry about relabeling items when they are shipped internationally. This can help keep costs lower and avoid mislabeling or other issues that could result in problems. Another nice thing about GHS is that it makes it much easier to keep everyone up to date with best practices. If it is found that a change in the location of labels, for example, will improve safety, then the GHS standards can be updated in one place and then rolled out globally. This is much more efficient than trying to get safety standards in each individual location updated one at a time. What is Globally Harmonized System? To dig a little deeper into what this set of standards really is it is good to look at a brief history of GHS. For most companies, GHS really became important back on March 26, 2012 when OSHA published their final rule that revised the old Hazard Communication Standard (HCS) to be in line with the GHS. This brought the GHS, which was already fairly popular outside of the United States, into this country. The update impacted millions of workers throughout a wide range of different workplaces. The update had a direct impact on things like the classification of hazards, the labeling requirements, the use of safety data sheets, training for employees, information gathering and classification. GHS was originally created by the United Nations in 1992. Its intent was to help bring greater agreement for chemical regulations and standards for people in different nations. This is and was important because of the fact that companies from around the world work together to make products, so it was critical to have one main standard. One thing to keep in mind when looking at the GHS is that in addition to knowing about it today, you also need to keep up with any GHS changes that take place in the future. Ongoing learning and implementation of these changes will help your facility to avoid compliance issues and operate as safely as possible. GHS is simple an abbreviation for globally harmonized system of classification and labeling chemicals, as stated above. When used in common conversation it can refer to specific types of labels that meet the GHS standards. It can also be used to describe the overall strategy a facility may take to implement or improve their GHS strategies. The specific way this abbreviation is used does vary from situation to situation, but it is almost always talking about how proper labeling and communication related to hazardous chemicals should be done. The first thing to note when it comes to GHS compliance is that it is not an international law. Many people hear that it was developed by the United Nations and think that there may be some sort of UN enforcement, but that is not the case. The UN largely created the standards and made them available to people and governments around the world. They do not, however, have any requirements or enforcement power related to whether or not any country or company follows their standards. That being said, however, there are many GHS compliance requirements in place in the United States. OSHA, for example, not only encourages the use of GHS but actually requires it in many situations. Depending on the specific type of facility you are running, you may be required to follow GHS standards related to labeling, data gathering or other things. GHS compliance was rolled out slowly to allow companies to make the necessary adjustments overtime so that it did not cause significant cost issues or disruptions to work. Today, however, GHS compliance is the standards that all facilities must be in line with to avoid potential fines or other penalties from OSHA or other regulatory agencies. Just to clarify, OSHA and GHS do not technically have anything official to do with each other. GHS was created and is maintained by an agency within the United Nations. OSHA takes the GHS standards and determines how they will be implemented in the United States. In virtually every case OSHA accepts the standards in GHS for the US. Of course, OSHA can submit recommendations for GHS but they do not control it. Likewise, the UN cannot and does not require that OSHA adopt GHS or any aspect of GHS. OSHA, however, recognizes the benefits of the globally harmonized communications standard and works hard to implement in throughout the country. OSHA does want you to properly classify hazards and in many situations they make it a requirement. If you don't classify the dangers properly you can be fined or even have more severe penalties implemented against you. Proper OSHA classification is essential for remaining in compliance and also for keeping people in your facility safe. Now that we've covered the basic background of what GHS is and how it came to be, it is time to look at more practical aspects of the system. The standards associated with GHS labeling are used in industries around the world and are some of the most recognizable labels and signs people see today. Learning about the GHS labels and how you can efficiently use them in your facility will not only make staying in compliance with GHS easier, but also help keep your facility and employees much safer. The following sections will touch on some of the requirements of GHS labeling and how you can implement them in your facility. There are many GHS labeling requirements that facilities need to be aware of. The specific requirements vary from industry to industry and chemical to chemical so make sure you are able to reference this type of information directly. Harmonized Signal Word - Signal words are things like "DANGER" or "WARNING" that can help provide information about the level of the hazard at just a glance. GHS Pictogram - A pictogram is a small, simple image that conveys a specific message. For example, an image of a flame will mean that the chemical is flammable. Hazard Statement - You must include a hazard statement, which briefly describes the hazards associated with the chemical contained within the container. Precautionary Statement - This is a statement that describes what precautions you need to take when working with this chemical. It may say that eye protection is required, for example. Danger - Danger is a more severe hazard and should be used when the substance being labeled can cause severe risks (death or long term problems) or it represents an immediate serious risk. Warning - Warning is not as severe, but still dangerous. Chemicals that may require prolonged exposure to cause health issues, for example, will use the 'WARNING' signal word. One important point to keep in mind regarding GHS signal words is that only one of them should be used per label. If there is no serious risk to a substance, the GHS signal word is not needed. One essential component of GHS labels is the GHS hazard pictograms. There are nine pictograms that are officially approved by GHS. OSHA requires that facilities use eight of these whenever they are applicable. The environmental pictogram is not required by OSHA because they do not have jurisdiction over this type of thing. That being said, most responsible companies today will use all nine of these pictograms in their GHS labeling strategies. Health Hazard - This pictogram is used for any chemical that can cause cancer, cause mutations, reproductive issues, developmental issues and more. It should also be used on chemicals that can cause respiratory issues or problems with specific organs. Flame - The flame pictogram is to be used on any flammable solids, liquids or gasses. If the chemical or other material is liable to ignite, this pictogram is needed. Exclamation Mark - This one is used for substances that can cause any type of damage to skin or eyes. For example, if a chemical can cause an allergic reaction, it should be labeled with this pictogram. Chemicals that can cause dizziness or other similar reactions should also be labeled with the exclamation mark. Gas Cylinder - This is to be used for any gasses that are contained under pressure. It doesn't matter what the gas is, if it is in a container (such as a cylinder) that is under pressure, you need to have a GHS label with this pictogram on it. Corrosion - This pictogram is to be used for any chemical that can cause skin burns or chemicals that may damage metal due to its corrosive properties. Exploding Bomb - Any substance or mixture that can cause an explosion. Whether it needs an ignitor to explode or it can explode in other situation, this pictogram should be used. Flame over Circle - This is for any oxidizer. These can cause fire on their own or by releasing oxygen or other gasses that have a flame risk. Environment - This is for an aquatic toxin. Any chemical that can harm fish, water based animals or plants. This pictogram can help ensure people know that the substance should not be disposed of down a drain or into the ground where it may run into a body of water. Skull & Crossbones - Any poison should have this pictogram. Whether the poison can cause harm via eating, skin exposure, inhalation or any other method. Even if the poison is not deadly, it should have this pictogram on it. While every part of a GHS label is important, the pictogram and hazard class is typically going to be the easiest to see and the first thing that people view. With this in mind, it is also going to be one of the most important parts of the label itself. This is why it is so important to make sure you have high quality GHS labels in your facility. Whether your order them from a third party or use a high quality industrial label printer, you will enjoy the benefits of staying in compliance and improving safety in your facility. On the topic of using high quality labels, you will want to make sure you are creating your GHS pictures from a good source. The pictograms were designed to be easy to see and understand with bold borders and distinct imagery. Using only the approved GHS pictures will help your facility to avoid any confusion or other issues. As mentioned above, a GHS hazard statement is a part of the GHS labeling requirements. A hazard statement should include a designated code and a specific statement that corresponds to the hazards that are associated with the chemical or substance that is being labeled. Proper use of GHS hazard statements is not only important for remaining in compliance with OSHA requirements, but also for keeping everyone safe. Physical Hazards - This category is going to be used for substances that can cause a physical hazard such as a fire, explosion or other issue. H200: Unstable Explosive - This should be used when the substance is unstable and can explode in certain situations. H221: Flammable Gas - This code is used when labeling any flammable gas. There are some more specific options (such as H223: Flammable Aerosol) that should be used when possible. H251: Self-Heating; may catch fire - Any substance that can heat up on its own (perhaps when exposed to oxygen, for example) and catch fire. Health Hazards - Health hazard statements are used when a substance can cause a health problem when consumed, inhaled, exposed to skin or in other situations. H300: Fatal if Swallowed - Any substance that can cause death if swallowed should have this code. H316: Causes Mild Skin Irritation - When labeling substances that cause mild skin irritations, this code should be used. This is important even if it requires prolonged exposure to cause the irritation. H350: May Cause Cancer - Any substance that can cause cancer should have this code on the label. Environmental Hazards - These codes are used specifically when a chemical or substance can cause negative aquatic environmental issues. H400: Very Toxic to Aquatic Life - Any substance that can cause death to aquatic plants or animals should have this code as part of the hazard statement. H402: Harmful to Aquatic Life - Chemicals that can harm aquatic plants or animals but isn't likely to kill them will need to have this code on the GHS label. H411: Toxic to Aquatic Life with Long-Lasting Effects - Some chemicals can cause aquatic environmental issues but will fade away after a short time. This code is for substances that can cause long term harm to the water it is exposed to. The following video goes into more detail about GHS hazard statements and the codes associated with them. You can look at some examples of different GHS categories by looking at some common pictograms that are used in each of the different categories. If you're looking for a very simple chart that shows the different pictograms that may be needed depending on what the hazard is, you can find a nice one HERE. The precautionary statement is an important part of most GHS labels. They will provide readers with information regarding what steps need to be taken in the event there is exposure, or what steps can be taken to minimize exposure to the hazardous substance. The pictograms discussed above are typically going to be a component of the overall precautionary statement. Most people will recognize these types of precautionary statements from normal warning labels on household items. For example, one precautionary statement could be, "Keep out of reach of children." Of course, this is not one that is likely to show up in most workplaces. Just like with the hazard statements, precautionary statements have codes associated with them as well. Here are a few examples of GHS precautionary statements commonly seen. Code P201 - Obtain special instructions before use. Understanding the requirements of GHS labels is very important. Just as important, however, is making sure you have access to the labels you need when you need them. This can prove difficult for some companies because they attempt to order pre-made GHS labels from a third party print shop or other provider. In addition to being more expensive in the long run, it is also not very efficient. The best way to make sure you have the labels you need when you need them is to use GHS label printers. A GHS label printer allows you to create the exact label you need right when you need it. There are many different options available when it comes to choosing the right industrial label printer for your facility. Looking at your specific needs and then determining which printer is right for you doesn't take too much time, but is well worth the effort. LabelTac 6 Duo Color GHS Printer - This is a high end label printer that can precisely print exactly what you need. It can handle virtually any size label and even make banners. It is also a color printer so you will have the flexibility to make color labels too. LabelTac 4 Pro - This is a smaller printer but is very easy to use. It can print quickly so you won't be waiting on your labels to complete a job. It is black and white, but can use standard GHS labels that come pre-printed with the needed colors. There are, of course, other options for GHS label printers. Finding the right one for your facility will help ensure you always have the ability to create custom GHS labels when you need them. When looking at creating labels for your facility it is important to note that you don't always need to print a full label. Thanks to the GHS standards, facilities can know some of the specific points that will need to be on every label they require. For example, the red diamonds or black outlines. This makes it possible to purchase blank GHS label supplies that come pre-printed with these types of things. This can provide your facility with a variety of cost savings. First, you'll be using less ink so that alone will save you a significant amount. Next, you can create color labels even if you have a black and white label printer. This is possible since the label stock you use will have the color outlines that are often needed. If you're looking for a simple way to add pictograms to almost any container, you may want to consider having GHS pictogram stickers on hand in your facility. These stickers are an extremely easy way to make sure you always have the proper pictogram in place when you need it. You can get pictogram stickers for all nine of the different hazards. Depending on the type of facility you run and what chemicals you use, it can be smart to just have a roll of each of these stickers to be used as needed. In addition to labeling, GHS has standards regarding safety data sheets. Safety data sheets, which used to be called Material Safety Data Sheets (MSDS) are used to communicate specific hazards that are related to chemical products. 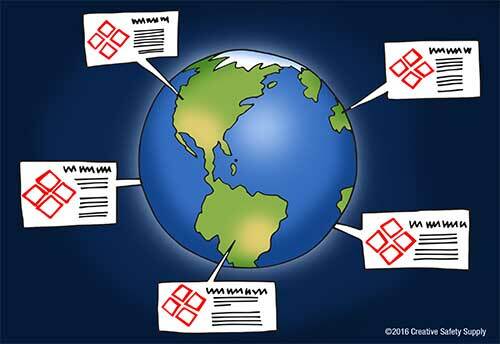 Like the labeling requirements, GHS has a variety of specific requirements for all safety data sheets. Identification - This will include things like the product information including manufacturer, distributer, address information, recommended use and more. Hazard Information - This can be a list of all hazards associated with a given chemical. Also included in this section is all the elements of a label that this chemical will require. Composition on Ingredients - Section three will need to have detailed information about the ingredients that are in a chemical. In addition, any trade secret claims must be listed here. First Aid Information - Here you need to document all symptoms or effects caused by exposure. Treatment recommendations should also be listed here. Fire Fighting Information - Document any recommendations on how a fire associated with this chemical should be fought. Also include details about potential toxicity of the smoke from the fire and other information. Accidental Release Information - This is where you will list all emergency procedures and protective equipment needed to deal with a situation where this chemical is accidently released. Handling and Storage Information - Detailed instructions for how this chemical can be safely stored and handled. Things like temperature requirements, altitude requirements and more can be listed in this part of the GHS safety data sheet. Exposure Control Information - Here you will add things like OSHA's permissible exposure limits, and other details regarding how much exposure may be safe with the chemical. Physical and Chemical Properties - List all the chemical properties. Stability and Reactivity Information - Any relevant stability or reaction information regarding the chemical. Toxicological Information - Information about how someone may be exposed (inhalation, skin exposure, ect) and effects of exposure. Ecological Information - Detailed information about any ecological impact this chemical may have. Disposal Information - List how this chemical should be safely disposed of. Included here would be preventative instructions such as "DO NOT pour down drain. " Transport Information - Any information needed for transporting the chemical safely. Regulatory Information - Detailed information regarding regulatory requirements. For example, if a chemical needs to be declared before crossing specific boarders. Other Information - Any other relevant information such as the date that the chemical was prepared. One of the best things you can do to make sure you are creating SDS's properly is to have an approved GHS safety data sheet example on hand that you can use as a guide. Keep in mind that most standard chemicals will already have GHS safety data sheets made for them, which can be used. You'll just need to update the pre-made sheet with any specific information regarding your company and how the chemical is to be used. 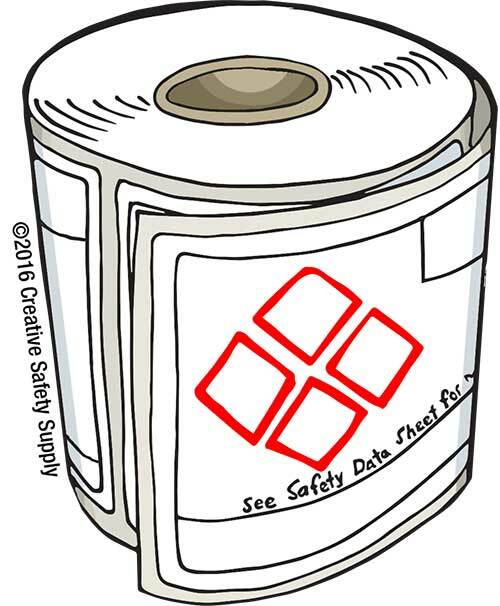 You can also find many templates for GHS safety data sheets. These make it much faster and easier to create an accurate data sheet on almost any chemical you can think of. Templates can also help ensure you don't make any errors on your SDS so that there is little risk of accidently being in violation of OSHA requirements. The last, but maybe most important, topic that we will go over is the GHS training that you will need in your facility. Just like any other strategy in your facility, if the employees don't understand it or don't follow it, then it will be virtually useless. With this in mind, you need to have a good training program created to help ensure everyone is on the same page. 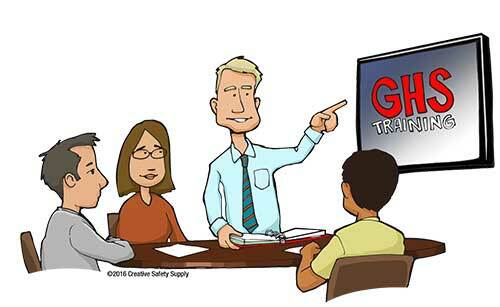 You will have a lot of options when it comes to providing your employees with GHS training. In most cases a company is going to want to use multiple different approaches to ensure their teams know everything they need to know to stay in compliance with the GHS requirements. Most new employees, for example, will need to go through an initial training session to get them up to speed regarding what GHS is and how it will impact their day to day activities. Some companies will provide this type of training on site as part of a new employee orientation program. Others send them to third party training seminars. Follow Up Classes - Offering annual 'refresher' classes will help ensure people don't forget anything important. Update Handouts - Whenever there is an update to the GHS standards or how your facility uses them, make sure you provide detailed explanations to each employee. GHS Posters - Putting up GHS posters in your facility is a great way to have a constant visual reminder to those who are working in the area. Coming up with the right long term strategy for your facility is very important. When done properly you will be able to ensure everyone understands GHS and follows the standards today and long into the future. When you understand the GHS system and how it works you will have no trouble seeing the benefits it can bring your facility. Even if you don't factor in the OHSA regulations and only look at the direct advantages to your facility, you can certainly see how great a system this can be. Whether you are operating a small local facility or an international company, you want to make sure you run everything as safely as possible. Implementing and keeping up on the GHS standards will help ensure your facility can be safe for your employees and the surrounding community. With that in mind, take some time to make sure you really understand how you should be using the globally harmonized system so you can move forward with implementing or improving it in your facility. You'll certainly be glad that you did today and long into the future.